In our last couple of posts, we looked at some historical methods used to produce charcoal, one of the key ingredients of black powder. In today's post, we will look at some methods used to extract the third ingredient of black powder, namely sulfur (also spelled as "sulphur" if you speak British English). As we've seen previously, the saltpeter (potassium nitrate) provides the oxygen needed for the gunpowder to burn rapidly, and the charcoal (carbon) provides the fuel. So what's the role of sulfur then? The sulfur helps to reduce the ignition temperature of gunpowder. Strictly speaking, it is possible to manufacture gunpowder using only saltpeter and charcoal, but the result needs sparks at a higher temperature to ignite. This is why sulfur was added to black powder to increase the reliability of ignition on early firearms such as matchlocks, wheellocks, flintlocks etc. If there is no sulfur in the black powder, then the chance of misfiring on these early firearms increases quite a bit. However, the presence of sulfur is also responsible for most of the smoke produced by burning black powder. Interestingly, a mixture of saltpeter and sulfur, but no charcoal, does not burn at all, although sulfur alone burns well in air and saltpeter is an oxidizer. Sulfur has been known since ancient times and has been mentioned in texts of ancient Egypt, Greece, India, China, Italy etc. It is even mentioned in the Bible as "brimstone". 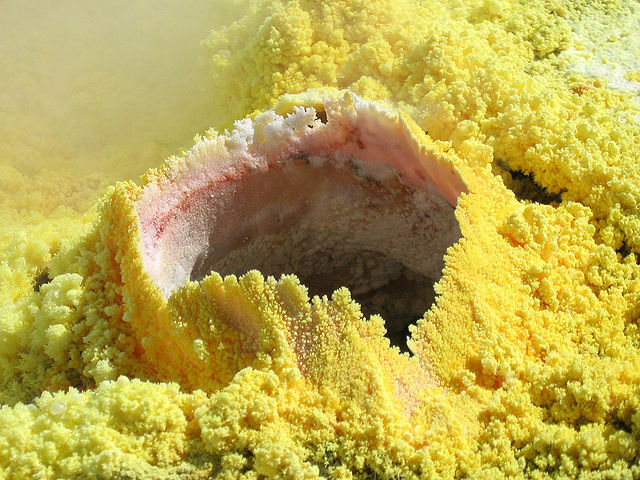 Sulfur is a pretty common element and occurs in many minerals, as well as in natural state (elemental sulfur). When it occurs in natural state, this is typically around hot springs and volcanic regions in many parts of the world (e.g. Sicily, Indonesia, Japan, etc.) It also occurs in minerals such as pyrites (fool's gold). One more source of elemental sulfur is salt domes in many regions of the world. 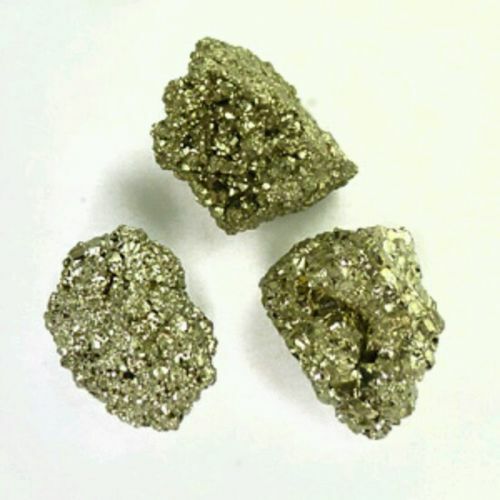 Three samples of pyrites. Click on the image to enlarge. Pyrites are also known as "fool's gold", since their shiny nature has fooled many people into believing that they have found some mineral containing gold in it. We have good accounts of how sulfur was extracted from pyrites in China. One book by Song Yingxing in 1637, describes the process: About 250 kg. (550 lbs.) of pyrites was surrounded by 500 kg. (1100 lbs.) of coal in a brick kiln, and a hole was left on top of the pile. The pile was then ignited at the base and left to burn for 10 days. The sulfur would form a yellow vapor that came out of the top of the pile and this could be condensed into solid sulfur crystals by covering the top of the pile with a simple earthenware bowl, as seen in the image below. Ancient Chinese process to make sulfur from pyrites. Click on the image to enlarge. Public domain image. There is evidence that the technique of extracting sulfur from pyrites was known to the Chinese, since at least the 3rd century. This process was somewhat wasteful in the amount of sulfur extracted from the pyrites, but since pyrites were plentiful in China, it was very commonly used there. In Europe, the main source of sulfur for many centuries was the island of Sicily, where sulfur occurs in its natural state (we will study its extraction in the next post) and was mined since Roman times at least. However, in 1839, the Sicilian deposits came under the control of a French company, which raised the price about three-fold. This led to a number of countries reverting back to extracting sulfur from pyrites, until the price dropped again. In the next post, we will look at how sulfur was extracted in Europe since ancient times until the middle of the nineteenth century.